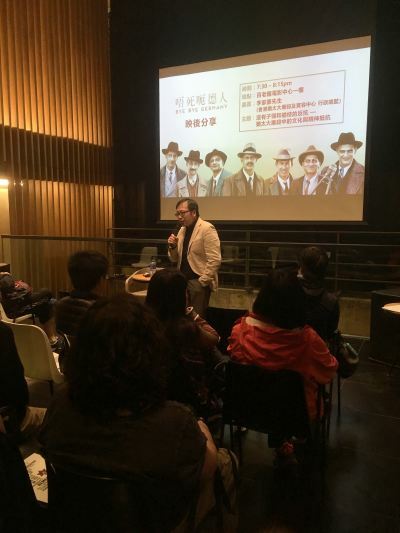 Simon K. Li is the Executive Director of the Hong Kong Holocaust and Tolerance Centre. 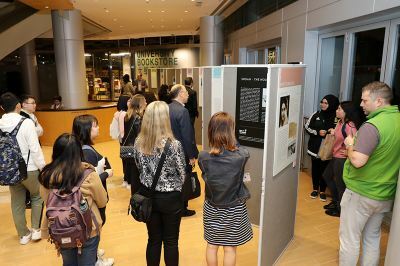 An award-winning former journalist in Canada, he was a Senior Lecturer and Visiting Educator at the Amsterdam-based Anne Frank House. 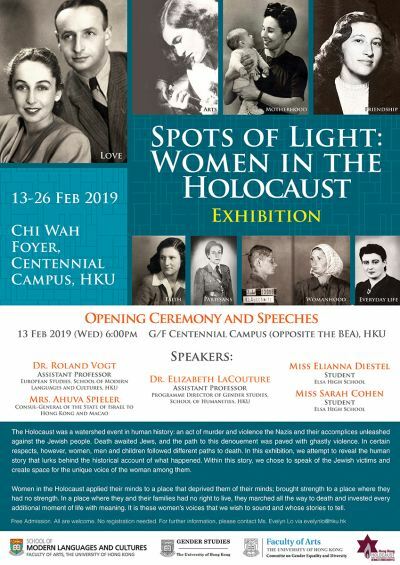 HKHTC was pleased to jointly coordinate the opening ceremony of the ‘Spots of Light: Women in the Holocaust’ exhibition with the University of Hong Kong (HKU) on Wednesday, 13 February. 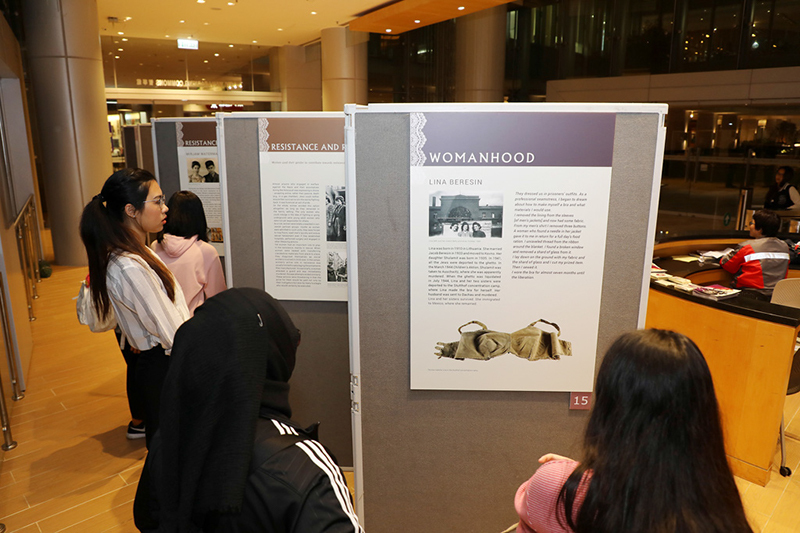 The well-attended event included presentations by Israeli Consul-General Ahuva Spieler, HKHTC board member Dr. Roland Vogt, HKU academic Elizabeth LaCouture and Elsa High School students Elianna Diestel and Sarah Cohen. This is a special project organized along with the University of Hong Kong and in cooperation with Yad Vashem. In cooperation with The Commercial Press bookstore, HKHTC co-hosted an International Holocaust Remembrance Day lecture presented by Simon K. Li. 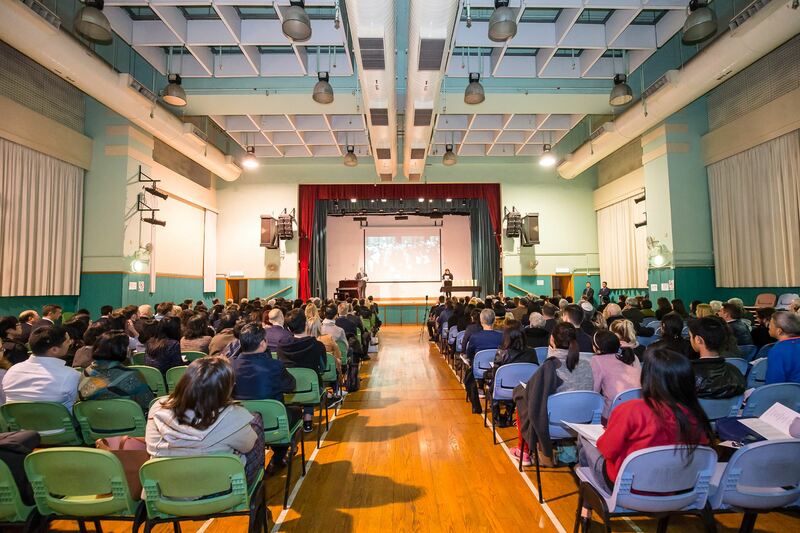 The public lecture was well received, with most attendees in the fully booked venue staying well beyond the scheduled event closing and asking many questions about the Holocaust. 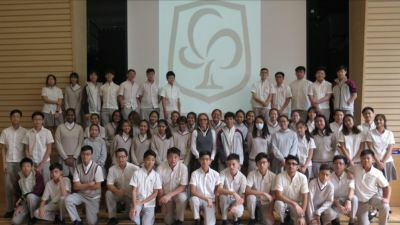 Budapest-born Holocaust survivor, Ms Eva Koralnik, Eva spoke to 11 schools and universities during her visit to Hong Kong and Macau. Her presentations created a personal connection with over 3,000 students and community members, the large majority of whom never previously met a Holocaust survivor. Feedback was overwhelmingly positive as Eva made an unforgettable impression on everyone who heard her story. 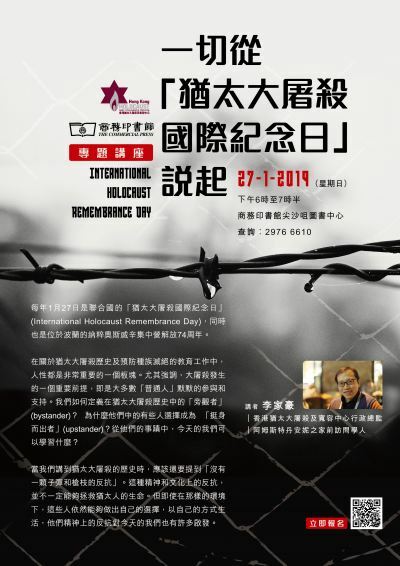 HKHTC hosted the United Nations Holocaust Memorial Day (“UNHMD”) commemoration on 23 January at Hong Kong’s Sai Ying Pun Community Complex. 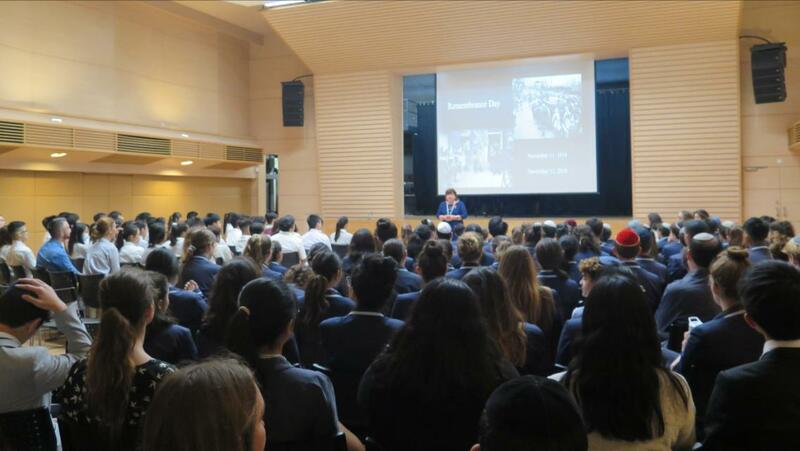 Budapest-born Holocaust survivor, Ms Eva Koralnik, delivered a moving and memorable keynote address to over 250 people. 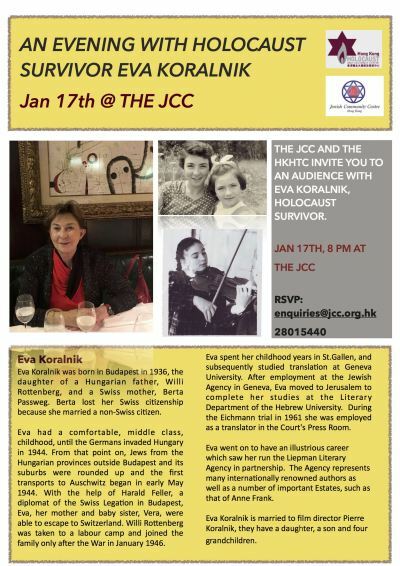 Eva told the incredible story of her escape from Nazi-occupied Hungary in 1944 and the noble actions of Swiss diplomat Dr Harald Feller to save Eva, her family, and many others. Dr Feller was later officially recognized as a Righteous Among the Nations. 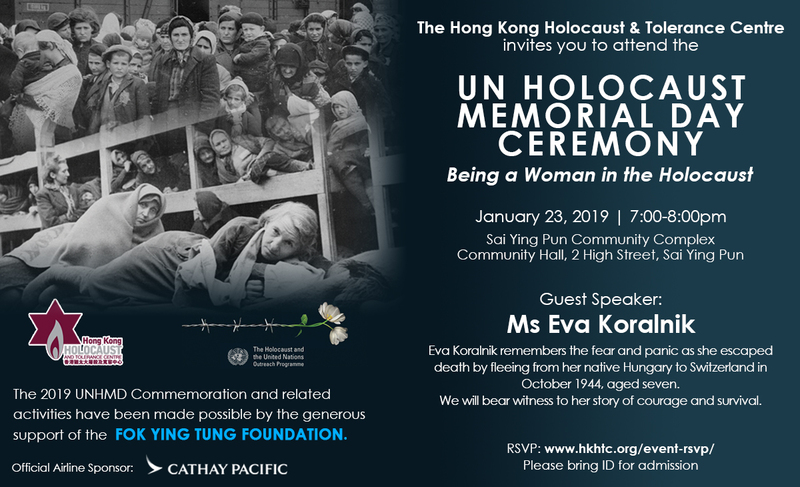 Eva’s deeply personal and eloquent account was a reminder of the terrifying consequences of hatred and intolerance, as well as the great difference one individual, such as Dr Feller, can make in our world. The UNHMD ceremony also included many commemorative activities, including the lighting of six candles in memory of the six million Jews who were murdered in the Holocaust. Consistent with the commemoration’s theme of “Being a Woman in the Holocaust”, the six candles were lit by female members of the community, following an introduction by Consul General Ahuva Spieler of the Consulate General of Israel in Hong Kong and Macau. 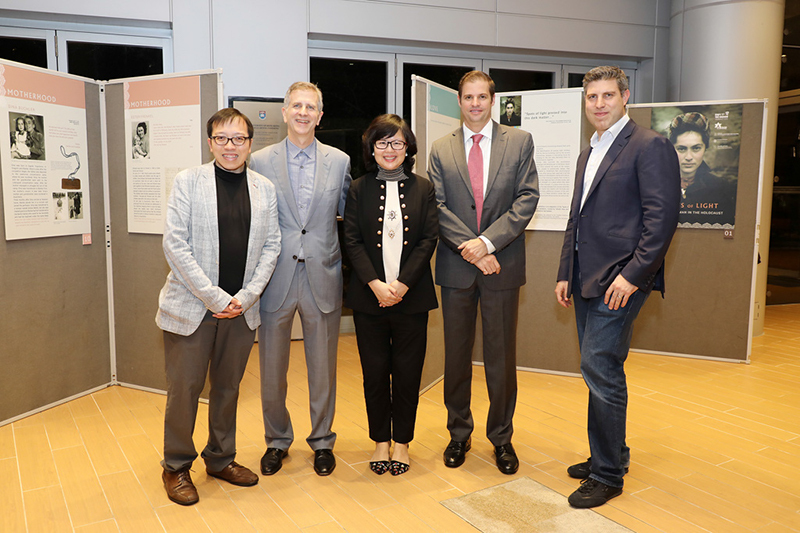 Attending dignitaries included the Hong Kong SAR’s first and former Chief Executive, the Honourable Tung Chee-hwa, and the HKSAR’s Permanent Secretary for Education Mrs Ingrid Yeung. 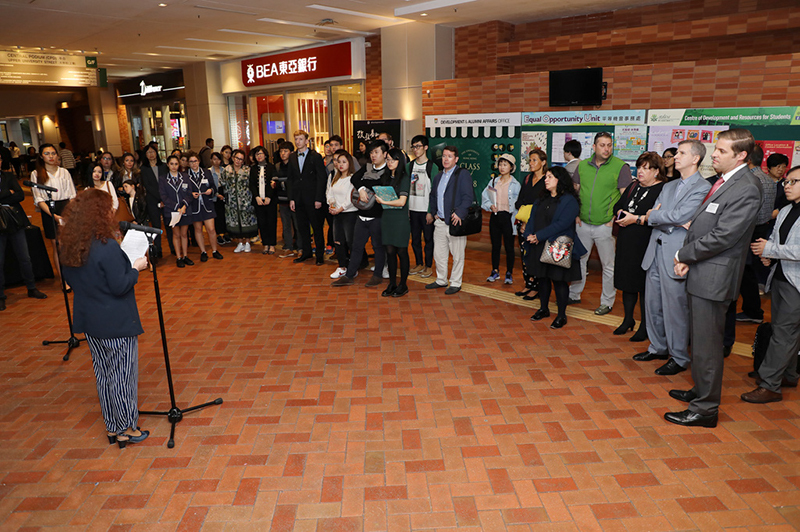 Many Consuls General, business leaders, and members of the local community also attended. The UNHMD commemoration and related activities were made possible by the Fok Ying Tung Foundation’s generous sponsorship. 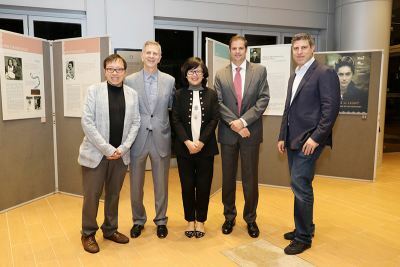 Cathay Pacific also provided strong support. 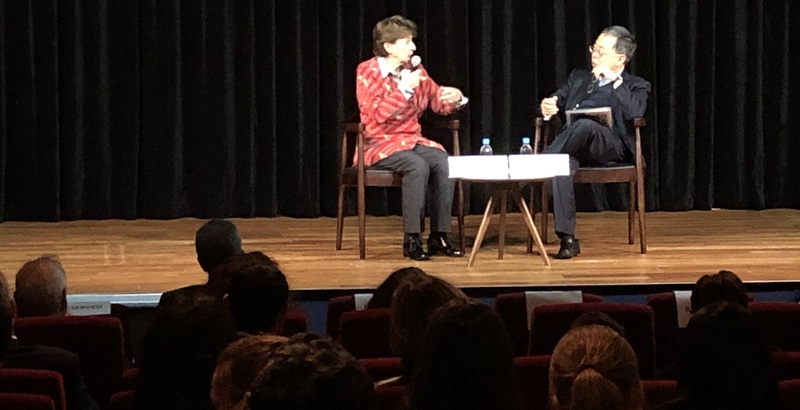 HKHTC was pleased to host an evening of dialogue with Holocaust survivor Eva Koralnik on 16 January at the Asia Society Hong Kong Center (“ASHK”). 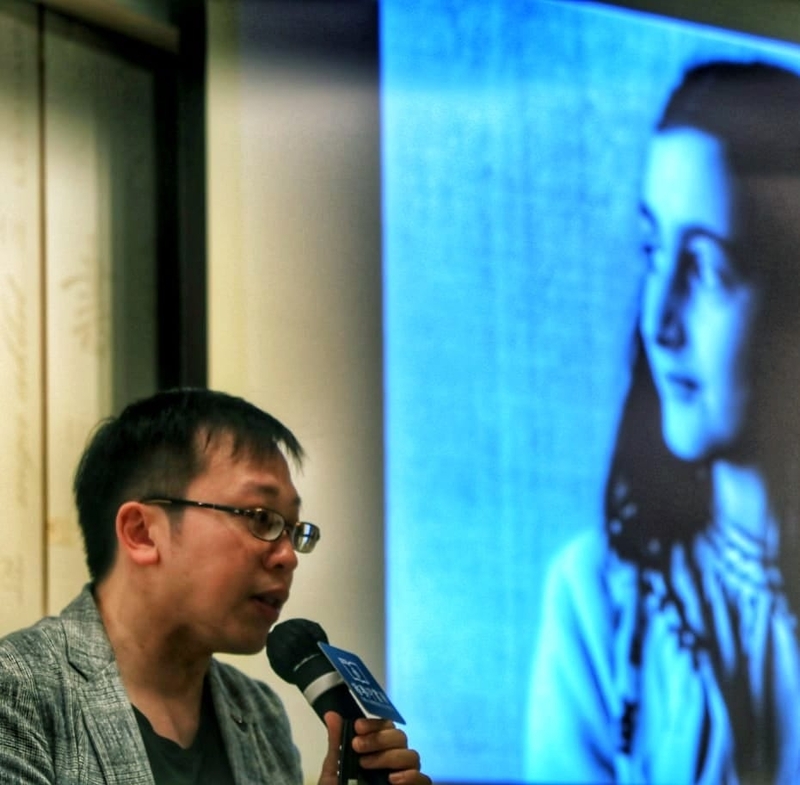 Eva engaged in a thought-provoking, special dialogue with ASHK’s Chairman Ronnie Chan. Focus was on Eva’s story of survival and her life in Switzerland since then, including her role as a translator during the Eichmann trial in Jerusalem and her career as a prominent literary agent. 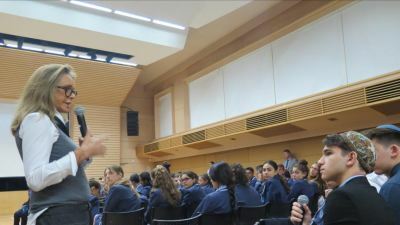 During the Q&A session, the audience heard Eva’s thoughts on a wide range of issues from her unique perspective as a Holocaust survivor. 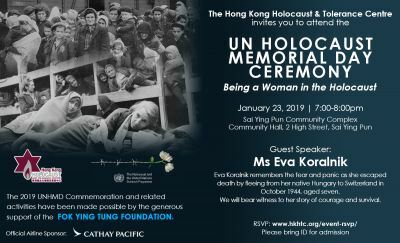 Prior to the United Nations Holocaust Memorial Day event, Holocaust survivor Eva Koralnik gave a detailed account of her story to a large, highly engaged audience at the Jewish Community Centre of Hong Kong on January 17, 2019. 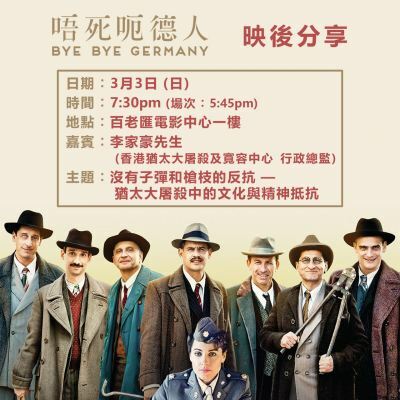 This evening event is co-organized by the HKHTC and the JCC. 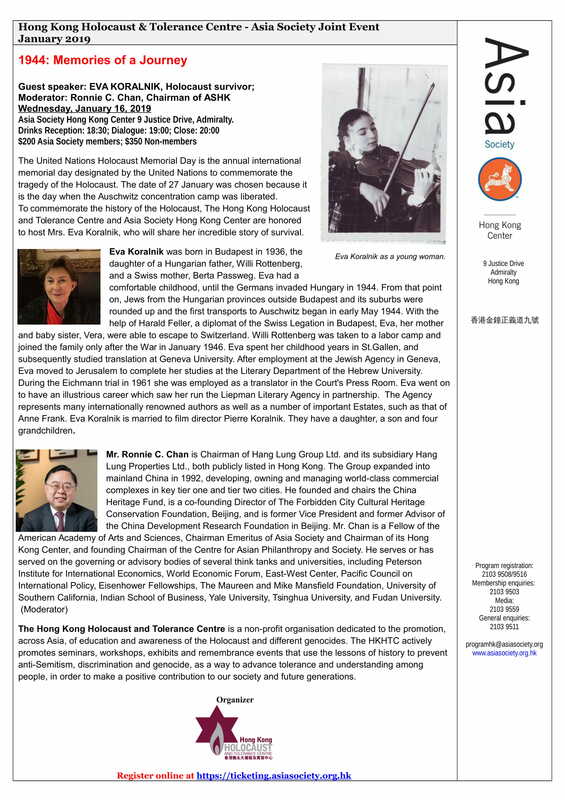 HKHTC greatly appreciates the community’s support as we continue to deliver high-quality Holocaust education programming and we encourage you to join us at our upcoming events. This year we have partnered with the Hong Kong Human Dignity Festival, which featured an HKHTC presentation by our Executive Director Simon K. Li on the Holocaust and genocide on Sunday 18 November at Eaton Hotel, 380 Nathan Road, Jordan, Hong Kong. 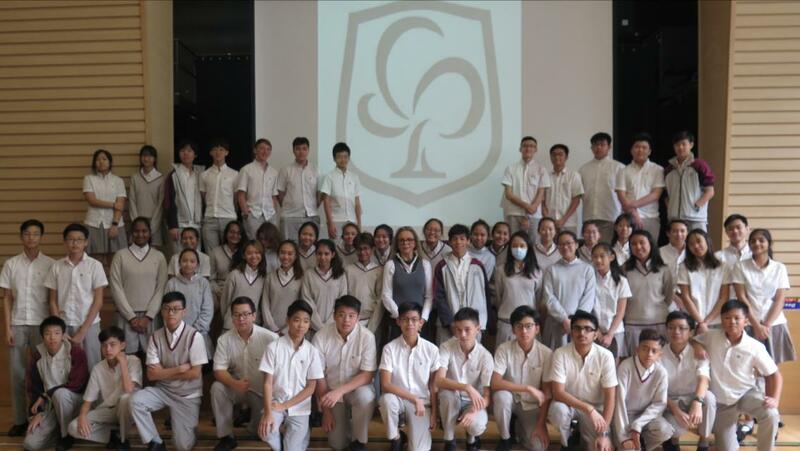 During the week of 12 November 2018, HKHTC was pleased to host the director of ‘Back to Berlin’ Catherine Lurie-Alt, who screened her film in local schools and participated in Q&A sessions with students. These events reached over 280 students in Hong Kong, who found the film to be a courageous stand against racism and were moved by the survivors’ stories portrayed in the narrative. 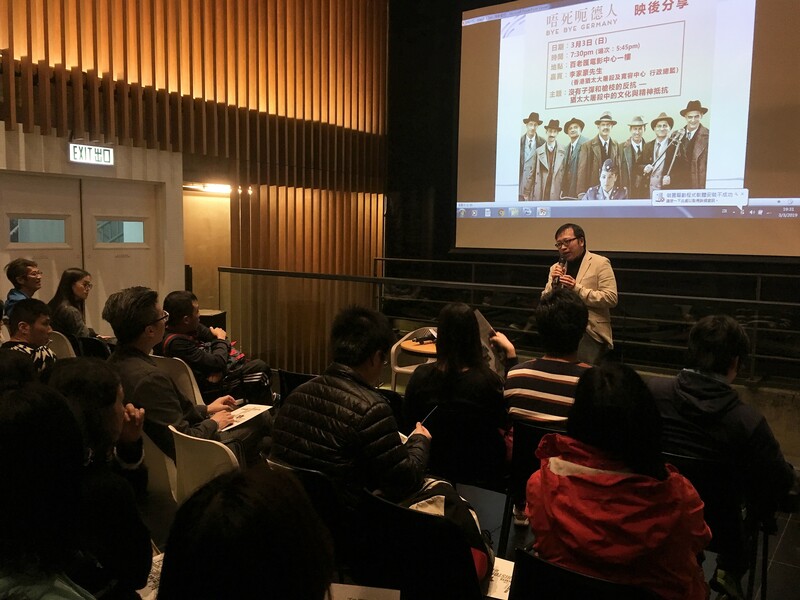 The Hong Kong Holocaust & Tolerance Centre was pleased to sponsor a number of Holocaust-themed films as part of the 19th Hong Kong Jewish Film Festival during 3-11 November 2018. As part of the commemoration of the 80th anniversary of Kristallnacht, HKHTC co-hosted a special screening and discussion at the festival with Catherine Lurie, the director of Back to Berlin. The film followed 11 Israeli motor-bikers carrying the Maccabi torch from Tel Aviv to Berlin, retracing the tracks of the original 1931 Maccabiah riders. In addition to this event, there were screenings of four other sponsored films, all of which will tok place at Asia Society Hong Kong Center at 9 Justice Drive, Admiralty. 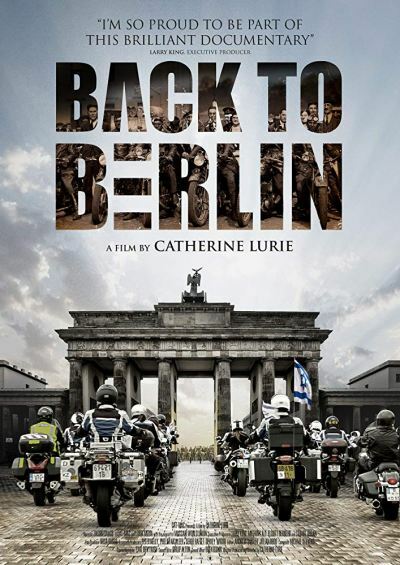 This screening featured a discussion with film director Catherine Lurie. At first glance, “La Muette” is a normal low-cost housing project like thousands of others in the Paris area. 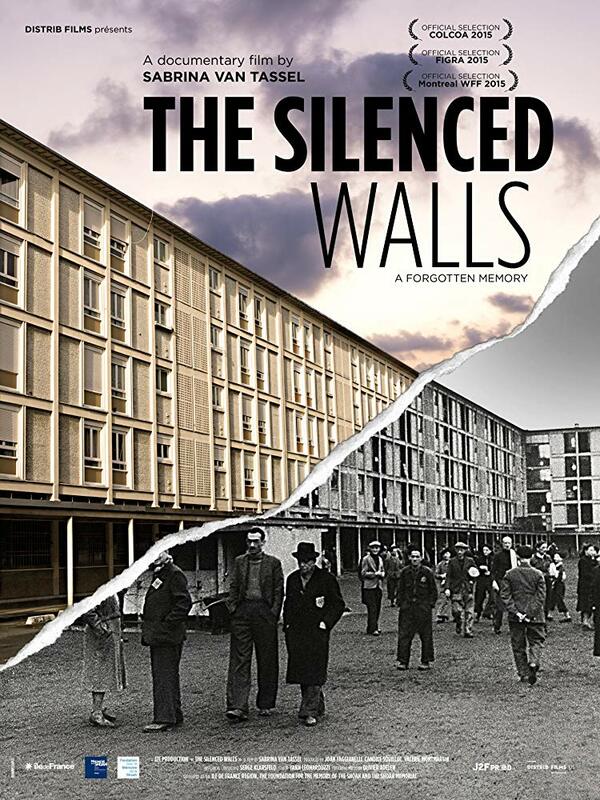 However, these walls obscure the concentration camp of Drancy where almost 80,000 Jews were held until most of them were sent to Auschwitz. After the war it was turned into a housing development with some of the lowest rents in the Paris suburbs. The current residents often cross the path of former internees during commemorations. They are constantly reminded of the past of the site. As if tragedy was attached to these walls. Yoel, a senior Holocaust researcher, is in the midst of a widely covered legal battle with powerful forces in Austria, concerning a brutal massacre of Jews that took place toward the end of WWII in the village of Lensdorf. An influential family of industrialists on whose land the murder took place, is planning to build a real estate project on the very same land. Yoel suspects that their aim is to bury the affair for good, but has trouble finding the conclusive evidence that would stop the project. 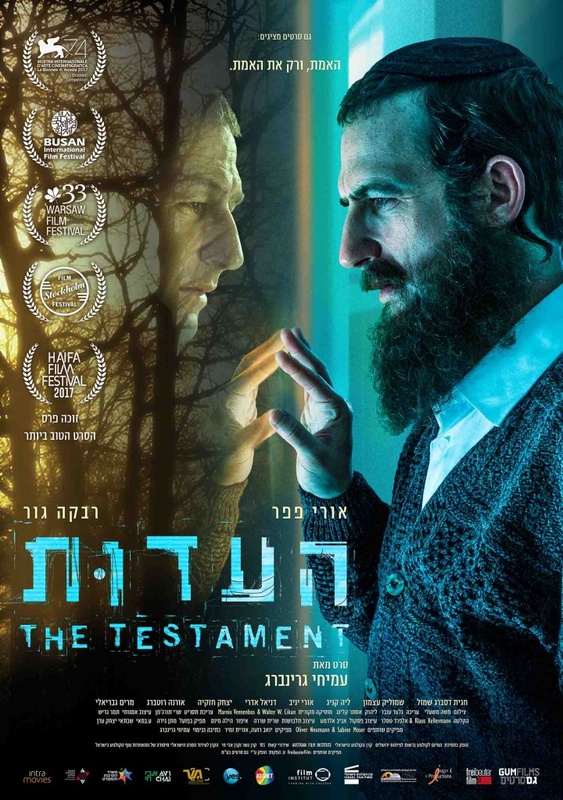 While investigating the incident Yoel examines classified testimonies of Holocaust survivors, and to his shock and surprise he finds a testimony given by his mother, a testimony he didn’t know existed. In her testimony she confesses to a substantial secret from her past. 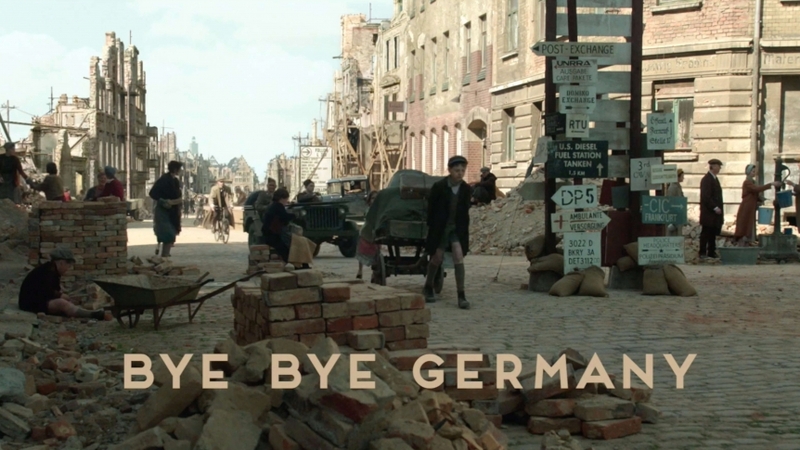 Yoel, who’s conducting a double-investigation, personal and scientific, is trapped between walls of silence – on one side, denial of the Holocaust on the part of the villagers, and on the other, his mother’s silence regarding her past. 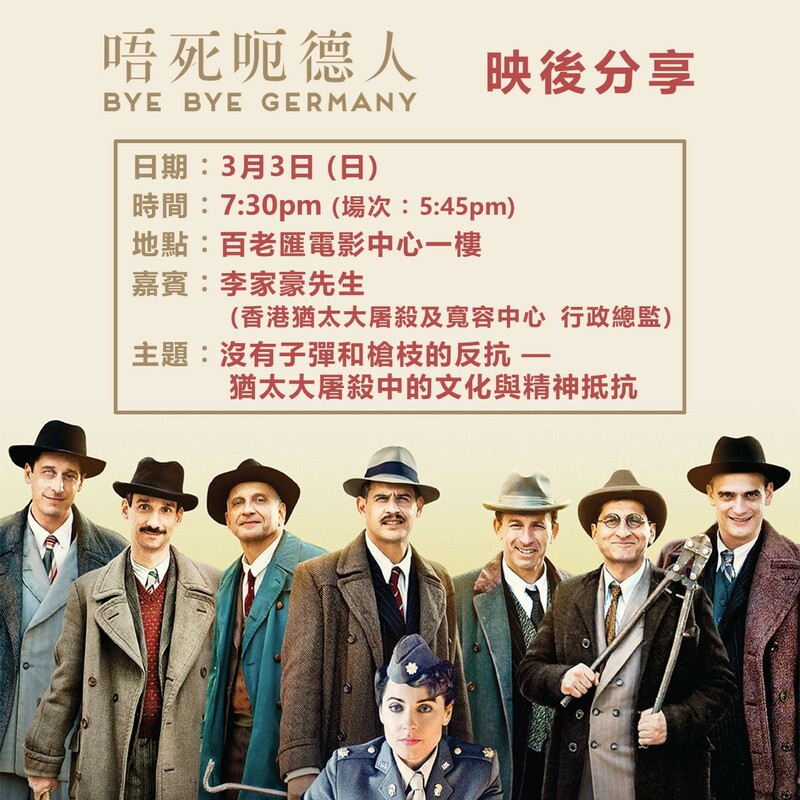 As a historian with an unshakable commitment to the truth, he decides to continue his investigations even at the cost of ruining his personal and professional life. *Please note both of these films are being shown as part of the “Six Shorts – One Ticket!” screening at the film festival (and can be viewed together with the purchase of one ticket). A woman is preparing her flat for departure. Step by step she seems to be following a strict plan. When she realizes to be missing some money for the train, she asks her neighbour for help. 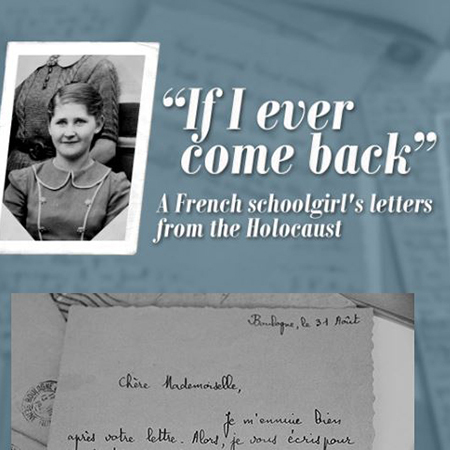 In 2010, a collection of wartime letters and photographs was discovered in an old cupboard at a high school in Paris. 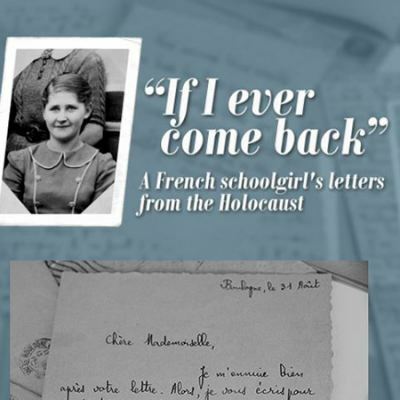 Forgotten for years, the letters were written by a former pupil, Louise Pikovsky, to her beloved school teacher during World War Two. The last note dates to the day Louise and her family were arrested at their home. 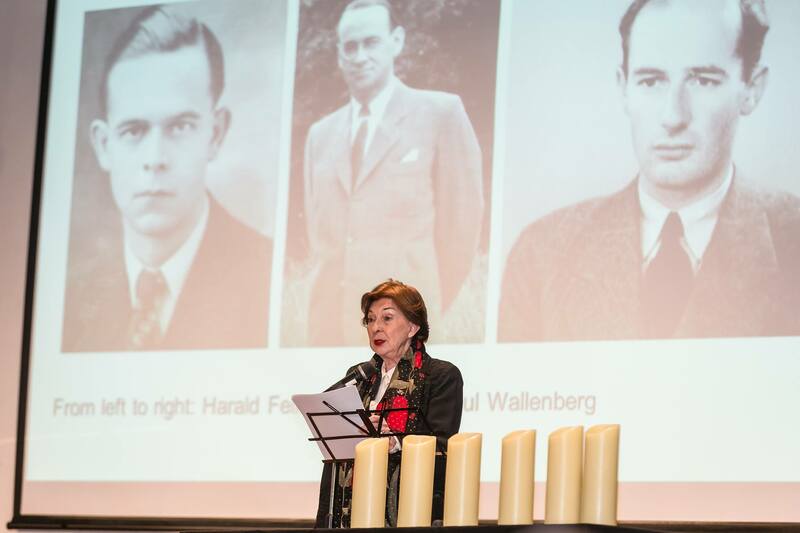 Father, mother and all four children were imprisoned in the Drancy internment camp near Paris before being deported to Auschwitz. 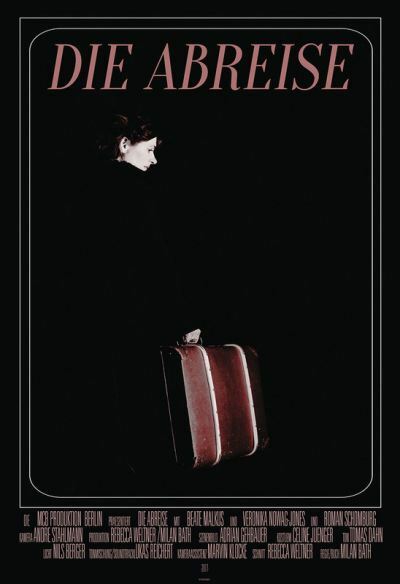 The Pikovskys never came back. 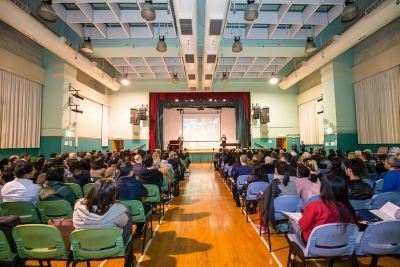 The filmmakers were able to track down witnesses, cousins and former classmates from her time at the lycée Jean de La Fontaine. Through months of research, they pieced together fragments of her life, and shed light on the circumstances of the family’s disappearance. More than seventy years after Louise’s untimely death, this film finally gives a voice to a talented young girl who was unable to fulfil the bright future she deserved.